God continues to speak His word and reveal His truth, revelations which mandate an open canon of scripture. … memorizing scriptures is like filling a filing cabinet with friends, values, and truths that can be called upon anytime, anywhere in the world. I want that for me. I want that for my children. Since I’m going to study one general conference talk a week until the next conference, I thought that I could use that opportunity to help my family memorize some phrases from living prophets and apostles. I am going to print out a brief phrase from each talk on the week I study that talk. I will hang it by our kitchen table and we will all say it out loud before family prayer and before each meal prayer. Hopefully we can memorize it by the end of the week. I went through each talk and picked out a key phrase from that talk that I thought would be easy for my family to memorize, but still packed a powerful doctrinal punch. I’ll paste them below in case it’s something you’d like to use as well. 14-Apr-13 President Boyd K. Packer We are free to choose what we will and to pick and choose our acts, but we are not free to choose the consequences. 21-Apr-13 Bishop Dean M. Davies Let us accept the Savior’s invitation to come unto Him. Let us build our lives upon a safe and a sure foundation. 28-Apr-13 Elaine S. Dalton We are each unique and different in our circumstances and experiences. And yet our part matters—because we matter. 5-May-13 Elder Craig A. Cardon Remember and believe the words of the Lord and […] exercise faith in Him unto repentance. He loves you. He wants to forgive. 12-May-13 Elder M. Russell Ballard The power of the priesthood is a sacred and essential gift of God. 19-May-13 President Henry B. Eyring We are under covenant both to lift up those in need and to be witnesses of the Savior as long as we live. 26-May-13 Elder Richard G. Scott The ideal place for […] peace is within the walls of our own homes, where we have done all we can to make the Lord Jesus Christ the centerpiece. 2-Jun-13 Elder Quentin L. Cook We earnestly hope and pray for universal peace, but it is as individuals and families that we achieve the kind of peace that is the promised reward of righteousness. 9-Jun-13 Elder Stanley G. Ellis Our Heavenly Father knows us, loves us, and wants to help. He knows best how to help. We are not spiritual orphans! 16-Jun-13 Elder John B. Dickson Heavenly Father loves all of His children, […] Jesus is the Christ, and […] the gospel is available to all, both the living and the dead. 23-Jun-13 Elder David A. Bednar Obedience to the law of chastity will increase our happiness in mortality and make possible our progress in eternity. 30-Jun-13 Elder Russell M. Nelson Now is your time to prepare to teach others about the goodness of God. 7-Jul-13 President Dieter F. Uchtdorf God promises the hope of His light—He promises to illuminate the way before us and show us the way out of darkness. 14-Jul-13 Elder Neil L. Andersen We are witnessing the miracles of the Lord as His gospel is spreading across the world. 21-Jul-13 Rosemary M. Wixom Why not choose a time each day to disconnect from technology and reconnect with each other? Simply turn everything off. 28-Jul-13 Elder L. Whitney Clayton Marriage is a gift from God to us; the quality of our marriages is a gift from us to Him. 4-Aug-13 Elder L. Tom Perry [Heavenly Father’s] commandments are the road map He has given us to return to Him, which is the only way we will be eternally happy. 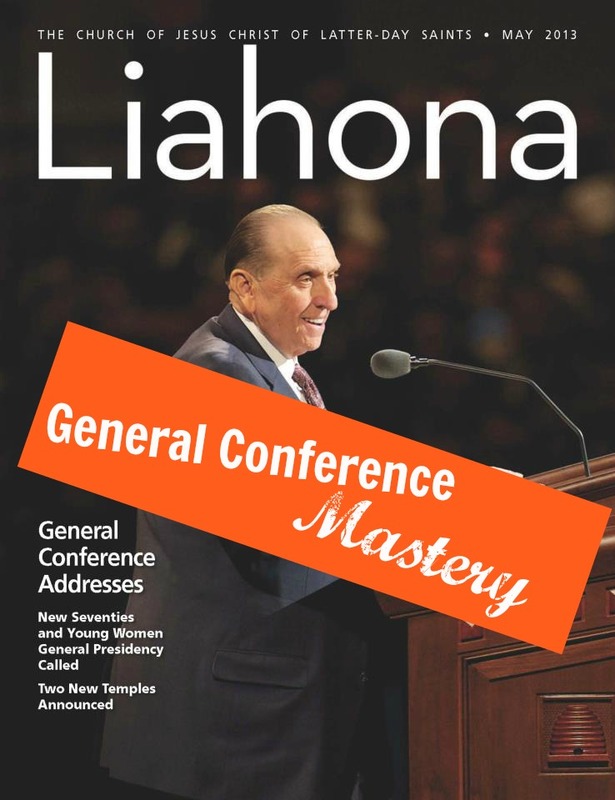 11-Aug-13 President Thomas S. Monson A knowledge of truth and the answers to our greatest questions come to us as we are obedient to the commandments of God. 18-Aug-13 Elder Jeffrey R. Holland In this Church, what we know will always trump what we do not know. And remember, in this world, everyone is to walk by faith. 25-Aug-13 Elder Dallin H. Oaks As Jesus taught, those who love Him will keep His commandments. They will be obedient. 1-Sep-13 Elder Christoffel Golden Jr. The Father and the Son are distinctly separate beings, but They are perfectly united and one in power and purpose. 8-Sep-13 Elder Enrique R. Falabella Home [is] the place that can become a piece of heaven here on earth. 15-Sep-13 Elder Erich W. Kopischke Seeking and receiving acceptance from [Heavenly Father and Jesus Christ] will always lift and encourage us. 22-Sep-13 Elder Bruce D. Porter We need not fear the future, nor falter in hope and good cheer, because God is with us. 29-Sep-13 Elder D. Todd Christofferson The greatest service we can provide to others in this life, beginning with those of our own family, is to bring them to Christ. The full text of all the talks can be found by clicking here. General Conference makes me happy. Good luck filling that filing cabinet in your mind full of friends. This is helpful to have! Thanks! Hey Steph – I pinned this, but do you have a printable/downloadable version of this somewhere? I just added a downloadable link at the end of the post. Hopefully that works. My kids are only 6 and 3, but having them recite a scripture as many times as their age (so, 6 times for the 6-year-old and 3 times for the 3-year-old) gets any scripture into the 6-year-old’s head in a week. Only short scriptures work for the 3-year-old, though; a combination of being only 3 years old, and only reciting it 3 times a day. This totally NOT spiritual, but Joel taught the kids to sing “I set fire, to the weeds..etc..” to the tune of Adeles, “I set fire to the rain..” The was our FHE. After watching the clip of him telling the story and what it means. That was the closing song, I wish I was kidding. i think im missing something… why are the dates all off? Those are the weeks I’m going to study each talk. One each week until the next conference. ¡Fabuloso! Thanks for creating the excel file! I love this! It’s conference in a nutshell 😉 Great idea, and the quotes you picked are some of my favorites. That is really awesome! I love it! This is WONDERFUL! We usually recite Articles of Faith in the car on the way to school everyday. I think we’ll add this into the mix! We also enjoy acting out the stories told during general conference for family home evening. I print out each story, roll them into scrolls, and then put them into a basket. For family home evening, the kids get to blindly choose which one to act out that night. Thank you so much for the excel file! It will help my family remember this conference. We’re also memorizing the proclamation as a family, 1 paragraph per week, as well as 1 scripture mastery. We did the articles of faith last year and I pop quiz them on the different scripture/etc as we walk to and from school daily. Thanks, Melanie! It’s a great addition and I love it. Love it Steph! Thanks so much! I’ve shared with a bunch of my friends! This is fantastic, my husband and I needed something like this, so thank you for taking the time to create it! !